Here it is! The long awaited review on the Glossier products that I bought from my trip to NYC! This post has been long overdue, simply because I had nowhere to shoot the products while I was in London on an internship and the lighting when I was in Montreal wasn't the best either. So alas, here I am, back in Newcastle and back on the speed of things. But I digress. 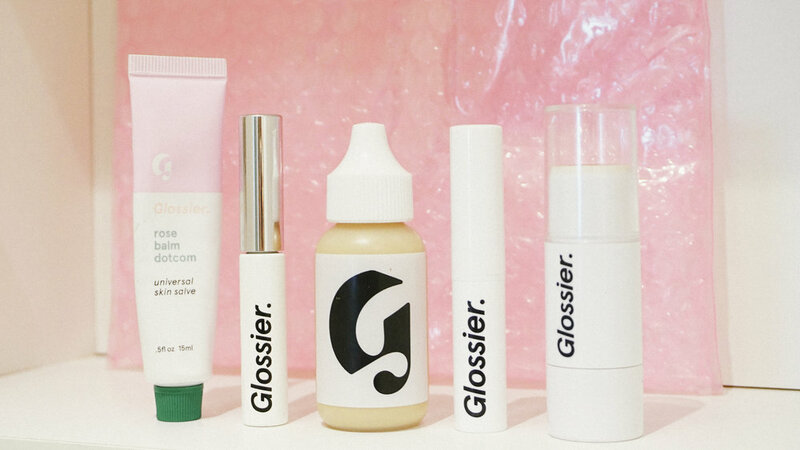 Glossier is a startup brand made by the makers of NYC blog Into The Gloss. It is meant to be a simple, affordable, yet chic and effective beauty brand that puts skincare first. You'll see that a lot of their products are meant to create that no-makeup makeup look that just enhances your natural features, which is also evident from their photography. I recently made a visit to their NYC showroom while I was in town and picked up a couple things: Rose Balm Dot Com, Boy Brow, Perfecting Skin Tint, and Haloscope. I think for all this I spent just above $100, which really when you think about it, isn't that bad. The Balm Dot Com is one of Glossier's cult products that have received so many praises everywhere. I am very particular about my lip balm. I have specific ones that I found works for me, however, petrolatum-based lip balms don't usually work all that well (think Vaseline jelly). Petrolatum-based lip balms tend to work more as a barrier for your lips than an actual moisturising product. I saw that this one also has some silica in it, which gives it that silicone-y slip that is relatively matte. With those two things in mind, I feel like this lip balm works better as a lip primer instead! I love using this below my lipsticks because it doesn't make my lipstick glossier than it should be and still acts as a protective barrier for my lips so it doesn't dry out as quickly. The slip also helps lipstick glide very smoothly. The scent of it is also divine. I love the sweet rose scent. It's nothing like a rose scent your grandma would have, and more like a rose cupcake, which I mean, hello? Now this one's a winner! Boy Brow is also one of Glossier's cult products and I can definitely see why. It has a pomade-like texture which keeps the brows in place, tinting it the perfect shade of brown, and does not dry stiff at all. It's pretty sheer but for brows, building up to the right shade is definitely better since I do like to start light and gradually go darker near the brow tail. Because it is more like a pomade, you need to treat it as such. It is not the most weather-proof and can definitely smudge if you have really oily skin, just like what would happen to pomade on your hair. That being said, for everyday, it's all I've been using and definitely beats my favourite, Benefit Gimme Brow. I bought this because it was raved by my dear friend (and name sister) Michelle who also writes a blog that you need to check out. If you like mine, you'll definitely like hers! Anyway, I was skeptical about this one since I thought it was going to be super sheer that it won't make a difference. While it is still sheer, I feel like it gives just enough coverage for everyday errands and going-outs. The texture is very liquidy and has that silicone slip, similar to YSL's Ink Foundation. You need quite a bit to build up coverage, but I mean, if you are looking for coverage, this isn't for you. This foundation just evens out the skin and makes it look brighter and more rested, but does not cover any imperfections you might have. Medium is a good shade for my light-medium skin as the shade Light is more like Fair. For comparison, I use NARS Pure Radiant Tinted Moisturiser in St Moritz, Milk Makeup Sunshine Skin Tint in Sand, Bare Minerals Complexion Rescue in Buttercream, Becca Aqua Luminous Foundation in Beige (summer shade), RMS Beauty "Un" Cover-up in 22, and Ilia Sheer Vivid Tinted Moisturizer in Ramla Bay. I loved using this foundation during the time I was doing my internship because it never made me look too overdone and yet still put together. It was also extremely lightweight so I never felt like I had makeup on. This one, I'll have to be honest with you, did not impress me. It is described as a sheer matte lipstick that gives the look of just blotted lipstick. I know it is meant to be sheer, but I just don't see how I would prefer this to my regular matte lipsticks that I already blot regularly anyway. The thing that put me off most about this product is that it does not offer the slightest bit of moisture to my lips whatsoever. It was really drying and I felt like my lips were getting parched. At that point I just had to use a lip balm, which of course, ruined the whole "blotted lip" look. On top of that, the packaging was super flimsy and cheap. Mine actually cracked at the cap! Crush is a pretty raspberry colour that adds just a bit of freshness to the complexion. All in all, I wouldn't get this again and I think I'll just be using this on quick errands. This much hyped highlighter really piqued my interest when people said it gives a similar dewy glow to RMS' Living Luminizer, a massive favourite of mine. Quartz is a universal pearlescent colour that leans a little bit more frosty than Living Luminizer. The outer ring is infused with actual crystals, which, along with mica, gives it that reflective glow, while the inner ring has all the oils for a dewy finish. I feel like this still comes second to the RMS highlighter, but a close second. It's definitely more affordable and imparts a similar glow to the complexion that is super nice and dewy. I love that it's on a stick as well so application is a breeze. I'm interested to try Topaz next!